It’s the ultimate irony: as an academic, you need to write to get promoted (or to even keep your job). Yet, doing the job leaves you no time for writing. So, you just agonise in silence, thinking that everybody else is managing this whole thing better than you. An effective counter-measure to these feelings and the associated lack of productivity is, according to Wendy Laura Belcher, to ‘make writing social’ (see her book here – no affiliated link). A small number of colleagues decided to get together and sit down for around two hours to simply do that. Just write. We did not check e-mails, answer the phone or even go to the toilet. First, it felt great to have those two hours of peace and quiet, in between meetings and teaching. I tend to write at home with my noise cancelling headphones on. So, it was great to see that I could work in an environment that I traditionally associate with being super busy. 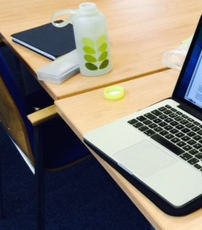 Second, hearing my colleagues type away was really… comforting! Yes, it was inspiring, and it was motivating. But I was expecting that. What was rather unexpected, and brilliant, was to feel part of this group – all with the same goal, all going through the same process, and no one adding to the other person’s workload. Third, because I knew that we were meeting, I prepared for it. I thought about what I might be working on, and I made decisions about what to prioritise. Then, I blocked the time and, as a bonus, I even spent less time (30 minutes, as opposed to the usual 1 hour) at a meeting because I had this commitment. I suspect that this type of arrangement would be relevant for other contexts, too. Maybe finding time to write a bid, to develop a business plan, to review progress… Not just the time, but also the mental space to engage with a task, deeply and creatively. Time and mental space to work on those activities that really matter in the long run, but that get squeezed out of your diary by the ‘busyness’ of everyday life. Loved it. How do you create time in your busy life for the very important but not urgent creative tasks? 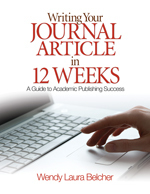 Posted on October 8, 2014 October 8, 2014 by anacanhotoPosted in Academic writingTagged Academic life, AcWri, Belcher, Writing, Writing group, Writing your journal article in 12 weeks.